A lovely circuit through the rugged north-east of Hong Kong's New Territories to the remote bay of Double Haven. Wind through disused paddy fields beside a stream, passing crumbling traditional hamlets and farmsteads. 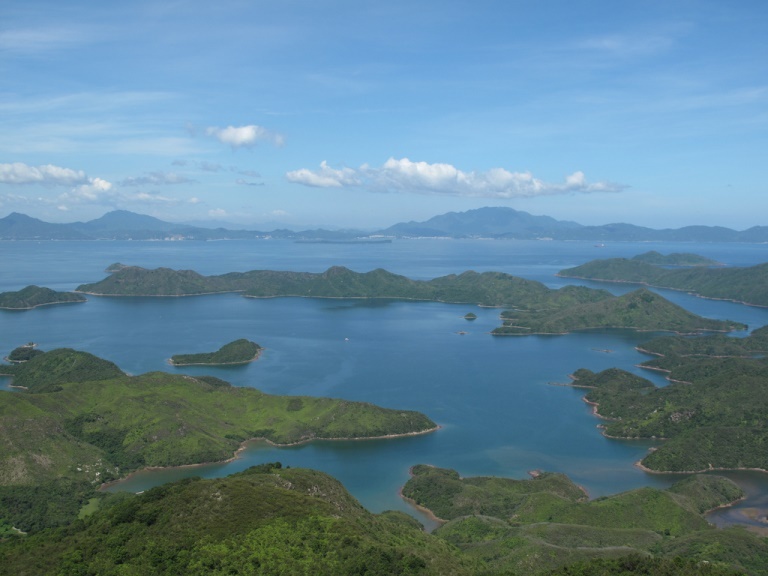 Enjoy the calm of Double Haven, sheltered deep behind its promontories and islands. Wander through a fine traditional village before hiking back across steep mountains clothed in forest and scrub, taking in some fine views. This walk starts at the typical New Territories village of Wu Kau Tang scruffy concrete 3 storey boxes crowded into an old site amid disused rice terraces. The path soon disappears into a valley of old rice paddies beside a meandering stream under rough green hills, passing the crumbling remains of traditional farmsteads and hamlets. Enjoy a perfect picnic where the stream tumbles down a shelf of rock. After traversing a rugged hillside, the path drops to a deep inlet of the beautiful Double Haven, a bay sheltered behind a series of promontories and islands. Behind the shoreline all is scruffy charm: overgrown fields, an ancestral village with a weedy square shaded by a huge Banyan tree, another with a laid-back eatery with a black-clad peasant granny perched in a corner. And then a trek up across the steep ridge from Lai Chi Wo passing patches of abandoned hardscrabble farmland fighting a losing battle with exuberant sub-tropical growth back to the refreshment stalls at Wu Kau Tang. Alternatively, you can cut back earlier at Sam A Chung on a path that winds around the contours of the hillside back up the same valley.